2120 Lake Michigan Dr., N.W. When reflecting on the life of Harriet Visser, it is easy to see that there was no greater joy in her life than her family. She was generous and welcoming to all who were near with a zest for life that was contagious. Harriet took her roles as a wife and mother to heart, but she just might have argued that nothing was better than becoming a grandmother later on. Hardworking and dedicated to whatever task was at hand, she gave everything her all. Life will never be the same without Harriet here, but she leaves behind a brilliantly colored mosaic of memories that her loved ones will forever cherish. 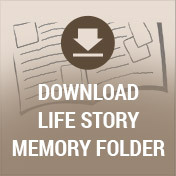 Life during the 1930s was anything but easy as the entire decade was cloaked in the hardship of the Great Depression. Jobs were scarce, the unemployment rate soared, and countless American families lost their homes as a result. 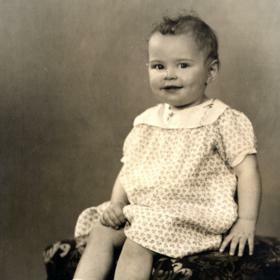 Despite the trials around them, John and Nellie (Kwant) Orange were pleased to announce the birth of the baby girl they named Harriet Lois on April 14, 1935, in Grand Rapids, Michigan. Raised in the family home on East Fulton Street, she was one of five children, joined in her family by her siblings, Lawrence, Lambert, Sidney, and Ken. The family attended the area Christian Reformed Church. As a student, Harriet attended Central Christian High School and graduated in 1953. After school, she worked as head waitress for the Ladies Literary Club. Big changes were in store for Harriet when she met the young man of her dreams. His name was Gerald H. Visser, and they met on a double date - although they were not on the date with one another. Gerald dropped his date off and promptly asked Harriet out. They began dating and soon found themselves deeply in love. Sadly, their love took on a different form when Gerald was drafted into the United States Army, causing them to continue their relationship through letters. 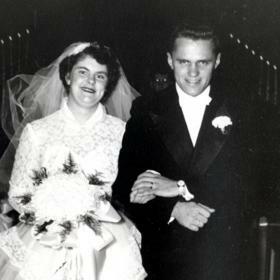 Once he returned home, Harriet and Gerald were married in November of 1954. The newlyweds bought a home on Jeanette St. NW. Together Harriet and Gerald lived a vibrant life. They welcomed five children including Linda in 1956, Brenda in 1959, Glenda in 1962, and twin boys, Gerald and John in 1963 into their hearts and home. Although Gerald had worked as a tech for Standard Oil Company for a time, he and Harriet later started their own company in which they sold and serviced petroleum equipment to gas stations. They owned and operated Visser Sales and Service together for nearly 30 years with Harriet working as the office manager. As their children grew older, their family moved to 1331 Northrup Avenue, which is where they lived until 1990. Throughout her life Harriet was a woman of many interests. She and Gerald belonged to the 1881 Square Dance Club. They met every month and attended many square dances together. They also went to to several square dance conventions over the years. Harriet and her husband frequented Jerry’s Road House and the Beltline Bar. 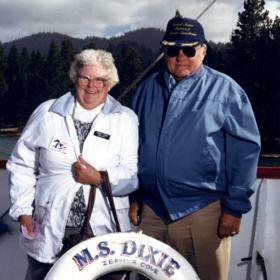 She also served as past president and member of the Women's Auxiliary of the Grand Rapids Sail and Power Squadron, a boating club. She was a wonderful cook whose specialties included liver and onions (also known as black fish), creamed cauliflower, banana salad, hoagie burgers, chicken broccoli casserole, potato salad, breakfast casserole, and braised spaghetti among others. 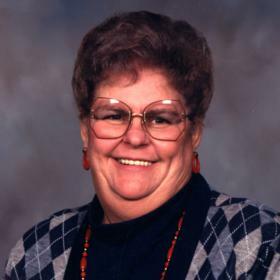 Harriet was an avid Detroit Red Wings fan and also attended several Detroit Tigers and Lions games with the family. She loved Christian music as well as reading romance novels and the newspaper as it was important to her to stay up with current events and politics. Harriet loved word search puzzles and was talented when it came to knitting and crocheting. She made countless gifts for family and friends; baby blankets, afghans, hats, mittens, scarves, and prayer shawls.  In November of 1988, Harriet’s life was forever changed with the death of her beloved husband. Her strong family ties and loving family sustained her, and she continued to run the business for a couple years but then closed it. Harriet moved to Ironwood Condominiums for a while and then to Covenant Village of the Great Lakes for a year. She suffered a pinched nerve in her neck, which severely limited her activity. As she got older, Harriet developed heart problems and moved to Vista Springs, an assisted living community. As her health declined, she moved to Brookcrest Nursing home in 2017. 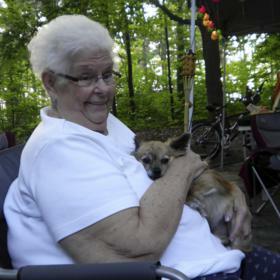 She was hospitalized last week and returned to Brookcrest where she was put under hospice care. With unending devotion to her family, Harriet Visser was a blessing in the lives of so many. She was faith-filled and compassionate, and although she could be a bit feisty at times she had one of the biggest hearts around. Harriet loved nothing more than being with her grandchildren, especially during the holidays, and her love for her family was easy to see. Deeply treasured, she will be forever missed.